Episode 98: Are meds always bad for depression/anxiety? – Psychology is based upon a different worldview than Biblical Christianity. – Whether or not to use medication for depression/anxiety is a wisdom/conscience issue. – Biblical counseling should be our automatic approach to depression/anxiety while seeing a medical doctor to rule out physiological issues. – There may be legitimate physiological issues that can be addressed by medication. Episode 97: Is it biblical to pursue wealth of any kind? 100 Episodes…Let’s Celebrate with a Contest! 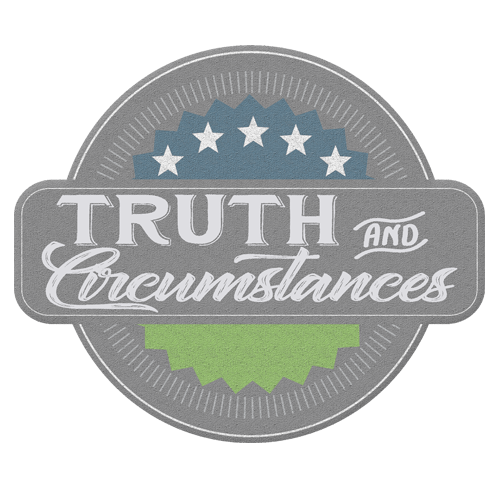 Our 100th episode of Truth & Circumstances is rapidly approaching. To mark the occasion, we are doing several things to celebrate. We’re broadening the field, so to speak, when it comes to questions that qualify. Typically, we ask for circumstantial questions. For this contest, you can ask any biblical, theological, ethical, or circumstantial question. The sky is the limit. The only questions that cannot win are anonymous questions (for the obvious reason that we wouldn’t know who to award) and questions that have already been answered (you know who you are). The winning question will be awarded…a $50 gift certificate to missionalwear.com. Don’t know about missionalwear.com? Just click missionalwear.com! They carry all kinds of products for the enthusiastically reformed: apparel, mugs, journals, bible covers, busts of your favorite Reformers…even cutting boards! That’s right—you can get a cutting board laser-engraved with the five Solas. The winning question will be answered on…the 100th episode, which will be live-streamed on Facebook on Tuesday, March 12 at 7pm. The live-stream will allow for realtime interaction between the T&C crew and anyone watching. The winning question will be answered by…a special guest. Don’t get too excited; it’s not John Piper. But like many of the reformers featured on missionalwear.com, he is a bearded pastor/theologian whom I greatly admire. We can’t wait to hear from him on the winning question. Tell your friends, tell your family, and ask those questions by submitting them on the Contact Us page at truthandcircumstances.com. Then tune in (log on) to the livestream on March 12 to see if you won! Episode 96: How can I help a high maintenance person? Episode 95: Does it really mean that? Does 1 Corinthians 14 Mean Women are to Keep Silent in Church? – Educate your conscience according to the Scriptures. – Paul allows for women to pray and prophesy in 1 Cor 11. – The prohibition against women speaking in 1 Cor 14:34-35 seems to refer to the judging prophecies (1 Cor 14:29-33). Episode 94: How should I relate to my nudist father? 3. Sometimes the most loving thing is to allow someone to feel how their sin cuts them off from others. Comment: My step-brother recently left his wife and two kids for another woman. It came unexpectedly, and has devastated both sides of the family. He hasn’t seen or spoken to my parents, or his siblings, since he left them. We’ve been supporting our sister and daughter in-law, and the children through this, as much as we can. I want to reach out to my brother, but I’m angry and disgusted by his actions, and I don’t want to say things that will only serve to tear him down. What’s worse, he says he’s a Christian, or at least claimed to be one for years, but his behavior throughout has seriously made me doubt his salvation. As an angry and concerned sister, how should I biblically handle the situation?